We are asking you or your organization to help us by donating pre-assembled Easter baskets. These pre-assembled baskets can be found at Family Dollar, Walmart, Walgreens, Target, and many other locations. Our age range includes babies up to 18 year olds. 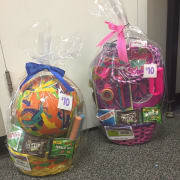 We are asking that the total price of each basket be under $15. You can also create your own basket. No time commitment- we just need Easter baskets! No requirements- we just need Easter baskets!